The new trailer for the highlighly anticipated action thriller Mandy has dropped this morning, and it is certainly exciting. The Nicolas Cage helmed movie has been met with rather high reviews thus far, and this first look at the movie itself has us truly excited. For obvious reasons, the biggest selling point of Mandy is its star, Nicolas Cage. Cage has a hit and miss acting history, but fortunately, the premise of Mandy looks like the right setting for the National Treasure star to truly shine. 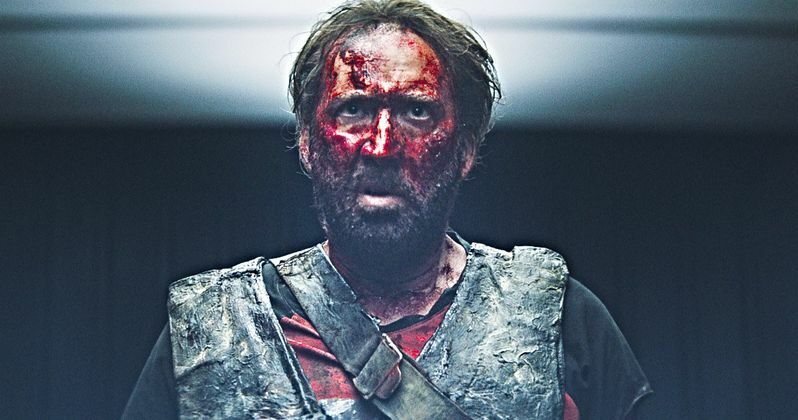 Cage's roots are in thriller movies, like Face/Off and Ghost Rider, so it's safe to say that Mandy will not be a movie Nicolas Cage fans will want to miss. Here is the official description of Mandy. "The quiet life of devoted couple Red (Nicolas Cage) and Mandy (Andrea Riseborough) takes a dark and bizarre turn when a nightmarish cult and their maniacal leader (Linus Roache) seek to possess Mandy...body and soul. A shocking assault on the innocent pair leads to a spiraling, surreal, bloody rampage of all out, mind-altering vengeance." While these types of thrillers tend to be hit or miss, the early reviews of Mandy strongly hint that it will be a hit. It currently has a whopping 97% critics score on Rotten Tomatoes, with a 92% audience score. Additionally, Metacritic currently has it scored at 82, which is still a great score for the movie. Here is what Rotten Tomatoes has to say about Mandy. "Mandy's gonzo violence is fueled by a gripping performance by Nicolas Cage -- and anchored with palpable emotion conveyed between his volcanic outbursts." Mandy also co-stars Andrea Riseborough, who is best known for Birdman and Oblivion. Riseborough plays the titular role Mandy, which, based on the description and the trailer, will be quite the interesting role, considering that she will seemingly be possessed at some point. Beyond the Black Rainbow writer and director Panos Cosmatos also wrote and directed Mandy. While he doesn't have the largest history, and is rather unknown in Hollywood, he's building up a reputation for intense thrillers, so hopefully Mandy will help to break Cosmatos further into the industry. Mandy is currently slated to release in theaters on September 14th. Additionally, it will release on Video on Demand and on Digital HD the same day. This is more common for independent movies that don't anticipate an enormous theatrical release. Because of this, it is more than likely that Mandy will only be in select theaters come September, unless the hype for the movie is seriously picked up with the release of this great new trailer. All in all, this new trailer has us absolutely excited to see the latest movie from RLJE Films. It has been too long since we had a movie that truly let Academy Award Winner Nicholas Cage shine in the right setting, so it will be great to see him do what he does best: go crazy in a crazy movie. You can watch the trailer for yourself below, and you can see Mandy when it releases in theaters and on digital on September 14th.